The whole reason you are building an MVP, as opposed to a full “version 1.0”, is because you’ve decided to take an experimental approach. You want to learn whether your concept is useful to the market you are going after before you spend too much time or money on the venture. Quality is an undefinable concern until after you know who your users are and what exactly they need in a product. Once you have the answer to those questions, THEN you can start worrying about the little details. If your product concept relies on aesthetics, or if you are entering an aesthetically rich market, then you might need to spend some time on the aesthetics of your MVP. For example, if you are in the market of selling wedding dresses online, you might want to get a professional photographer to take photos of the dresses as opposed to relying on your shaky iPhone pics. That is because the whole experience of buying a wedding dress online undoubtedly depends on whether the user thinks the dress looks good. That would be a minimum requirement. Now, do your users care if your website looks like every other Bootstrap website on the internet? Or that the “buy now” button is blue? Maybe, maybe not. We’ll find that out as part of the grand MVP experiment we are running. I’ve spent the bulk of this blog post trying to convince you that aesthetics, except for a few exceptions, aren’t too big of a concern for your MVP. But I don’t want you to take that to mean that aesthetics don’t matter at all. In fact, aesthetics are what I think you should worry about next. Human brains are hard wired to like aesthetically pleasing things more than others. When it comes to products, we are willing to overlook some crappy functionality if it is aesthetically beautiful. If a product is beautiful, we might even convince ourselves they work better! So as soon as you validate your concept with an MVP, you need to come right back around to worrying about “look and feel.” Because aesthetics are what sell, aesthetics are what make users feel good, and aesthetics are what make users want to show off your product to all their friends. In essence, aesthetics are what will help your product grow. Go ahead and use the templates, components, and design patterns that are free for the taking. 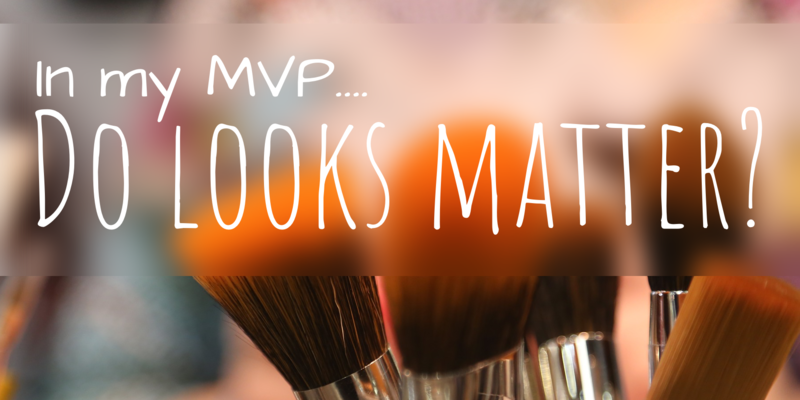 Who cares if your MVP looks like every other Bootstrap/Wordpress/Shopify webpage on the internet? If it helps you get the MVP out faster then it is worth it. You can customize it later. Keep it simple. Your MVP is not the place to re-invent how a date picker looks (or any other UI component, for that matter). You can customize it later. When in doubt about colors, go with black and white. Picking colors seems like it should be an easy thing, but its really not. So when you are trying to get something out there fast, go with black and white. They are classics that never go out of style. And, like I said before, you can customize it later. Do spend a small amount of time thinking about your target market, the product use case, and to what degree aesthetics play a role. Only worry about the aesthetics of features that would be obvious “deal breakers” in the market space. Otherwise, you can customize it later!